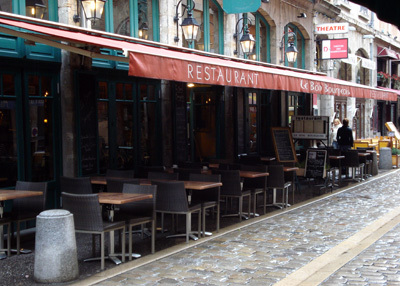 Le Bon Bourgeois is located on a pedestrian street in the heart of Lyon. The restaurant is relatively comfortable. The decor is typical of a traditional bouchon. The service was good but a bit slow. They certainly could do with a bit more staff. You may want to avoid that place if you are short on time. I had a “salade savoyarde” as main course. 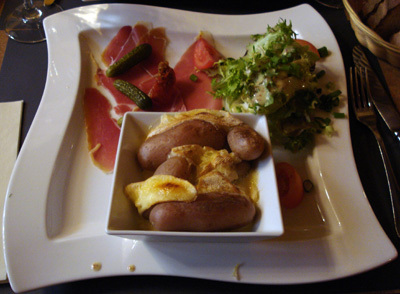 The salad was composed of hot potatoes covered with raclette cheese, ham with French pickled cucumbers and salad with vinaigrette sauce. It was simple but very good. 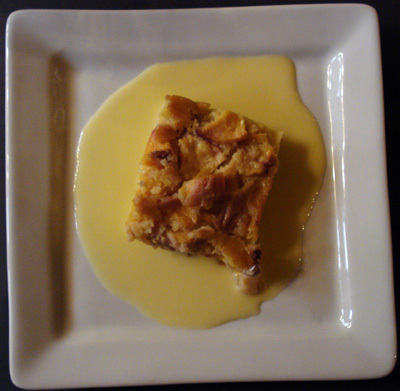 As desert, I had peach clafouti. The clafouti was excellent. The pastry was crumbling while the fruits were soft and juicy. Around $35, including drinks (red wine, espresso) and tip. If you consider the food, the restaurant and the current strength of the euro, Le Bon Bourgeois offers excellent value for money. I will come back, but this time for diner as the service is a bit too slow for lunch.